Are you ready for a fun, fresh, modern swap? It's here! 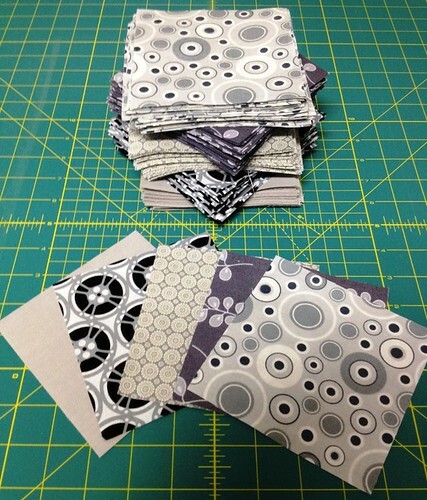 I am teaming up with the talented Lori of Adventures in Fabric to bring you the Modern She Made Swap. Sign ups begin April 1st and will close April 6th or when we hit 100 participants, whichever happens first! You will be able to suggest what type of item you would like from your partner but there's one catch .... the project must contain at least one circle somewhere in the design. Are you up for the challenge? We are going to have lots of fun, so all you modern swappers get ready for an amazing swap! Remember the Monster Charm Swap I was so excited to get in? The color I got assigned was gray so here are my 5 yards of fabric all cut up into 5" charm squares. No idea what I will do with the squares when I get them back, but the idea of getting such a wonderful variety of colors back in a charm square swap is just awesome to me. Check another task off the list! 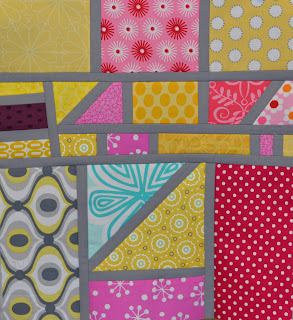 Here are the Mod Mosaic Blocks for Leah. She sent the sashing fabric and a few swatches so we could stay in the same color family. 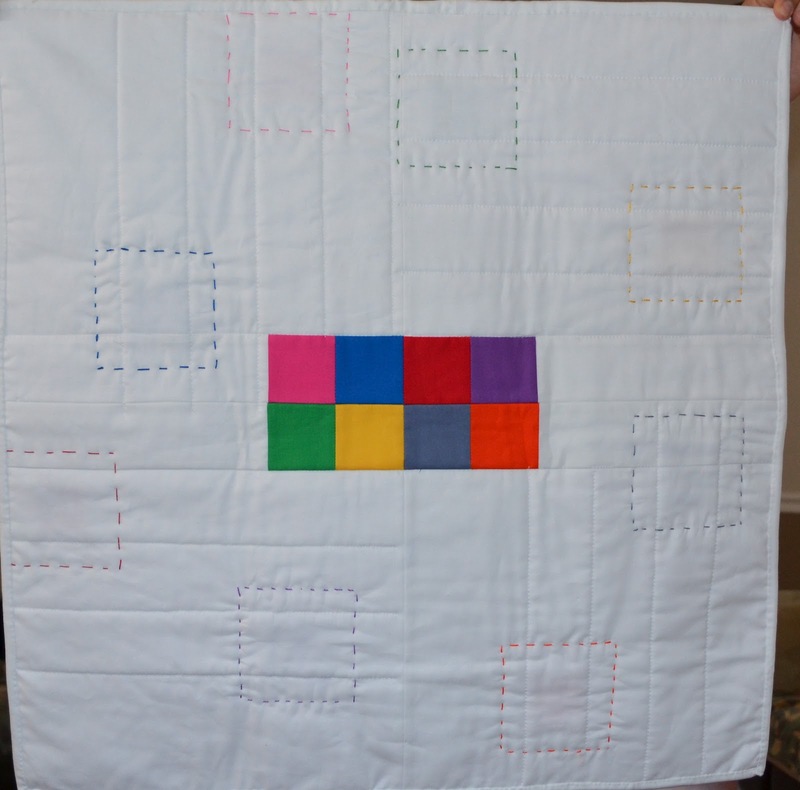 She asked us to add from our stash and use the one aqua piece in only one of the blocks. I am not sure what she has in mind for her finished product but I really love the gray. These are enroute to Australia. And in case you want to see the variety, here are the January and February blocks. Guess what I got from my For the Love of Solids partner! This amazing sewing machine cover, plus a wonderful pouch, fabric scraps and some note cards. Mr. Maxtin thinks the pouch is just great but my favorite is the sewing machine cover. I had written about how much I love chartreuse green lately but that I really am not a lover of green fabric so Stephanie of Spontaneous Threads incorporated the green into the project in a perfect way for me. She did an awesome job and I am so appreciative that she had me as her partner! 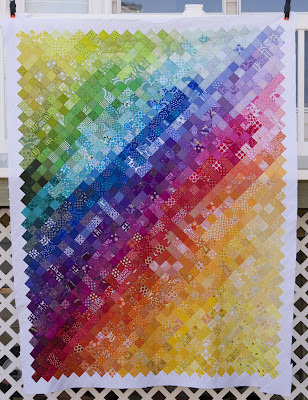 Go check out her quilts, she is so talented and in fact she just won first place in the Tangerine Tango contest. Many thanks Stephanie and a big congratulations to you on your well-deserved win! Do you remember the progress photos for this swap? The one I was so excited to get in and then the one I needed to finish as the deadline was approaching? Here it is! I used all Kona Cotton for this mini-quilt. My partner was Charlotte of Lawson and Lottie fame. 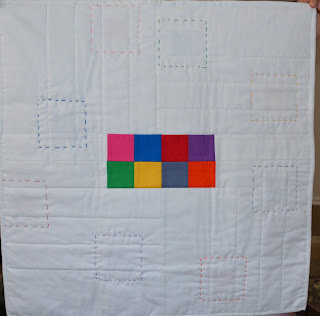 She has a neat feature on her blog called Sundays Sewing Space where she takes us on a tour of select quilters crafting space. Stop over and check her blog out! Hi! I was on vacation last week in the Grand Canyon but we flew in and out of Las Vegas. On the day we were going to leave, our flight did not depart until 7:30 p.m. and it was only 1:30 p.m. so we had 6 hours to kill. Mr. Maxtin suggested we head to the airport early but I thought of another idea, let's go find a quilt store! Lucky for me we were less than 10 minutes away from Quiltique. Woo hoo! I circled the store a couple times and then once more, just in case I missed anything. Boy is that an understatement. I was sitting in what I can only assume to be one of the husband's chairs, next to Mr. Maxtin, while looking up on my phone about this curve master foot. It seems to be amazing, but if you have a Bernina you also need another foot or adapter to go along with it, so....since Quiltique is also a Bernina dealer I was looking up the adapter. The phone was not fast enough and Mr. Maxtin asked if we were done so I abandoned the idea and decided I should go pay. Just a few moments earlier, a woman (who I later found out was Sharon of Sew Extreme) had entered the store and was visiting with Kara, a salesperson. And then it happened -- she pulled out a bolt of fabric I had missed. It was Washi, and it was right in front of me. In fact, the entire line was there. She pulled out 6 different bolts. Well well well. Since I was getting ready to pay and I wanted to get my hands on some of that fabric I had to figure out my strategy. Kara saw me walking to the register, but eyeing the fabric so she mentioned to Sharon to be careful as it looked like I wanted some. Indeed! Then, the nicest thing happened to me. Sharon said I could go ahead of her, but only if I wasn't going to buy more than a few yards of each (after all, she did find it first). Wouldn't you know it, I wanted all the ones she pulled out but assured her I just wanted a couple of yards of each of them and so we started chatting. It seems we have a lot in common. We both love fabric (especially bright colors), we both blog, we both took vacation in the last couple of weeks and we both love the Washi line. I am trying to convince her to attend Quiltcon next February. Also, we promised to show each other our completed projects using the fabric. Ok Sharon, today is March 19, so by March 19, 2013 I expect a project. She only gave me two months for my project (she said a month, but I countered with two). 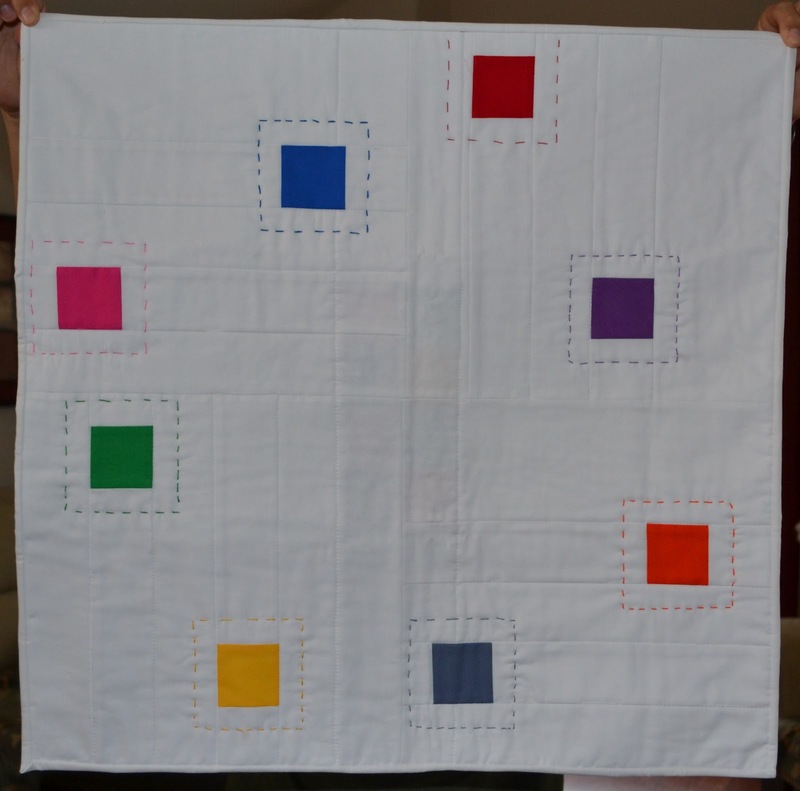 I made a friend and the best part of all is that it just makes me love quilters even more. Such wonderful people our quilting world consists of! So glad to have met you Sharon and I can't wait to see what you make! and hope to end up a fabulous block for my Travelling Circles Bee! Busy week but I'll check in soon. 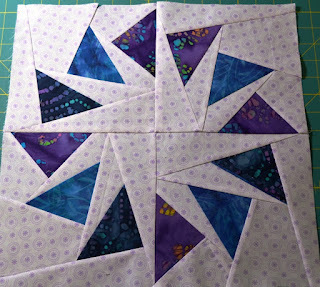 I am going to make a triangle quilt this year and auditions have begun! Here is one stack I am pondering but I am also considering black and white as well. I suppose before I cut into any of it, I really should decide the purpose. I LOVE the pattern and I want to love the quilt too. Auditions will be held for a while and you'll be the first to know the winners! I am excited to have gotten into the For The Love of Solids Swap, but I am so nervous about what I am making for my secret partner. Many ideas have been considered, but I finally decided on one. The last day to mail out is Saturday (tomorrow!) so I had to just decide and run with it. Did you happen to catch that I don't have any blue thread? Yeah, well that is my mission after work today - find that shade of blue! Here is a sneak peek and I'll be back next week to do a full reveal! I have a lot to do this month and I need to keep track! You know, the online quilting community is so full of encouragement. 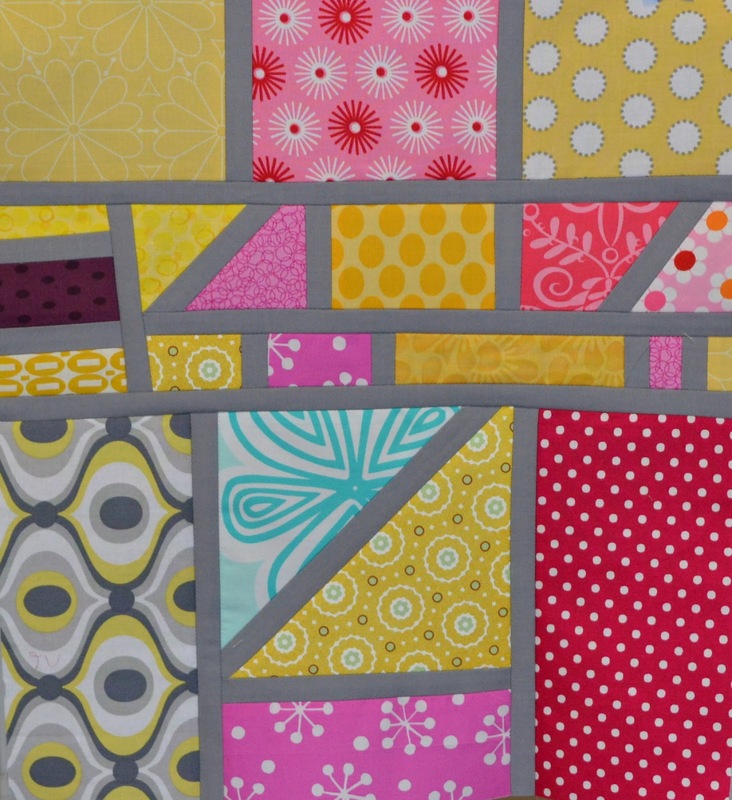 You can find anything you need with just a few clicks and quilters are more than happy to share when you need direction. One way to show support is to participate in a Small Blog Meet. Lynne, from Lilysquilts has a link up where you can post if you have less than 50 followers. I fit in that category so I am linking up. I have been visiting some other blogs out there that are new and there is so.much.talent! Click on over and see what she has going on - it's always good. I promise! Lessons to Live by when you Paper Piece! Well.....in my Travelling Circles Bee, our hostess requested Circle of Geese - AAACCCCCCKKK! I have always admired these, so very much, but never wanted to actually do them. They look so hard, I'll bet they take so much time. Not one to be deterred, I started in right away, stitched them right up until I had the 4 pieces ready to go together....and then my heart sank. I trimmed them on the line that was supposed to be the seam allowance. I only did it to three of them, but still......I had to start over. I had to ask the hostess to send me more background fabric, Uggggh. So I got the fabric and was ready to go and I finished them right up this past weekend. Alas, another bump in the road. 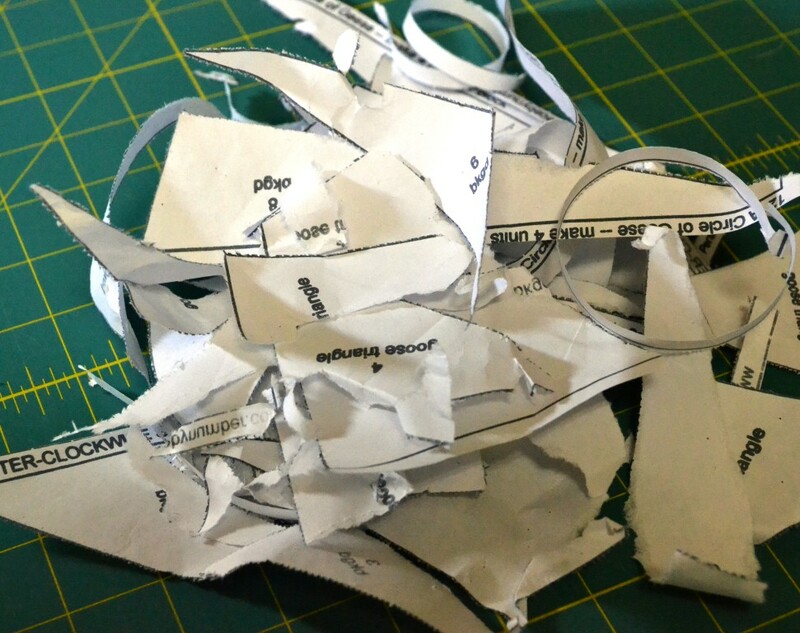 On a couple of them I had forgot to reduce my stitch length so it was a small challenge getting all the paper off. 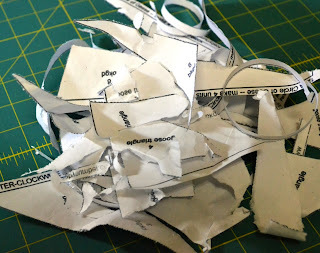 and since you are here, let me expand on what I have learned from my second paper piecing project ever. 2) Use your "paper" needle. Someone told me this does make a difference so when I am doing this method, I have a needle that I colored in green marker at the top that I use. 4) Don't be cheap with the fabric. I have tried to cut it close and I can't tell you how many times I went to press it down and it just didn't quite fit to the line - ugh. The seam ripper and I spent too many hours on this. Cut fabric with plenty of edge around it before you sew. Although I am still a bit scared of paper piecing, I'm actually starting to like it. My first attempt came out good and I think this one did too. Practice makes perfect - I need to keep on practicing! Monster Charm Swap opens today! Katie from The Blue Chair is opening up a HUGE charm square swap today for rainbow charms. Take a look at what she made and read all about it here. If that isn't some inspiration to join, I don't know what is. Hop on over to read the details here and mark your calendar for 3 p.m.(CST), as that is when sign-up starts and get ready - this one is sure to fill up fast!